News TV Channel / Channel 10 is a terrestrial broadcaster nationwide Nicaragua, owned by Ratensa Communications, which belongs to businessman Remigio Ángel González and is in Residencial Bologna on 10th Street west of the city of Managua, or hotel Mansion Teodolinda, 2 blocks below, in Bologna. 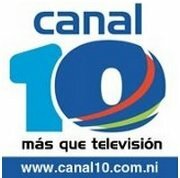 Canal 10 was founded in 1997 by the Ratensa Group of Nicaragua. From its beginnings the channel counted on a newscast called Telediario 10 that soon was replaced by the noticia Action 10. At present the newscast Action 10 - that is a news of red note - is the most tuned by the Nicaraguan people (according to the own channel).